EURUSD hasn’t been able to the lows and right now is trading upwards. 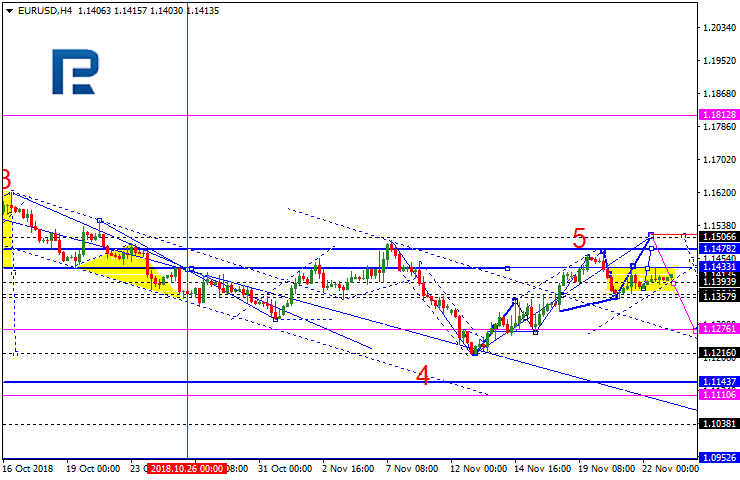 Possibly, the pair may choose an alternative scenario to form one more ascending wave with the target at 1.1500. Today, the price may form this wave by growing towards 1.1478, returning to 1.1433, and then reaching the above-mentioned target. 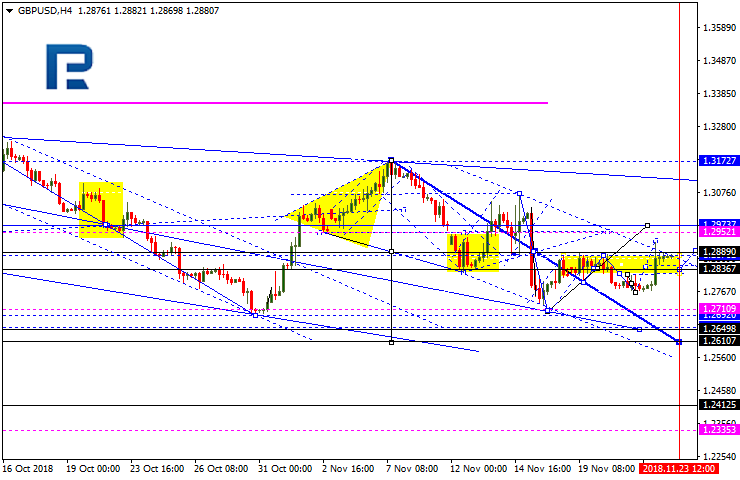 After that, the instrument may resume trading inside the downtrend with the first target at 1.1276. GBPUSD may choose an alternative scenario to grow with the target at 1.2973. Today, the pair may trade upwards to reach 1.2950, fall towards 1.2888, and then start another growth to return to the above-mentioned target. Later, the market may resume falling to reach 1.2650, at least. 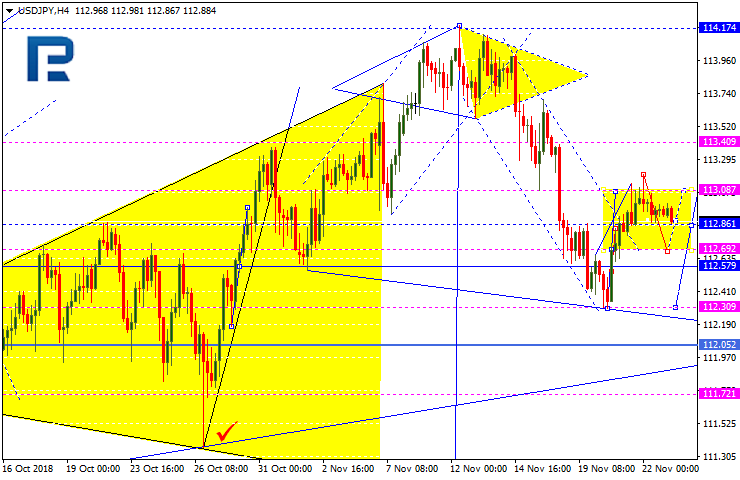 USDJPY has completed the first ascending structure. Possibly, today the price may start a new correctional decline towards 112.70 and then form one more ascending structure to reach 113.40. 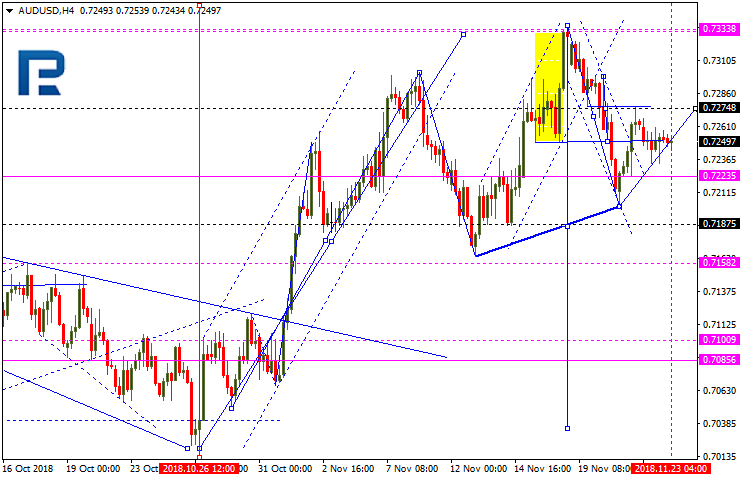 AUDUSD is consolidating around 0.7249. If later the instrument breaks this range to the upside, the price may choose an alternative scenario to reach 0.7333; if to the downside – resume trading inside the downtrend towards 0.7000. The short-term target is at 0.7187. USDRUB is consolidating above 65.75. 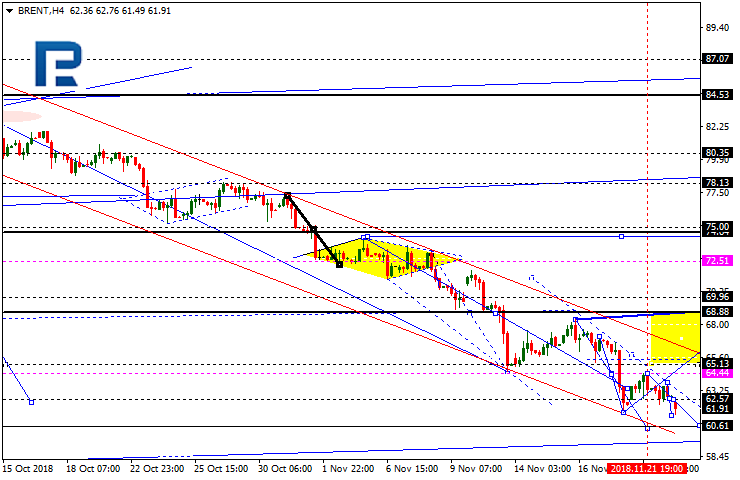 Possibly, today the price may form a new descending structure towards 65.37 and then resume growing to reach 65.76. If later the instrument breaks this range to the downside, the price may continue falling inside the downtrend with the short-term target at 63.43; if to the upside – start a new correction towards 66.50 and then resume trading towards the above-mentioned target. Gold is trading upwards. 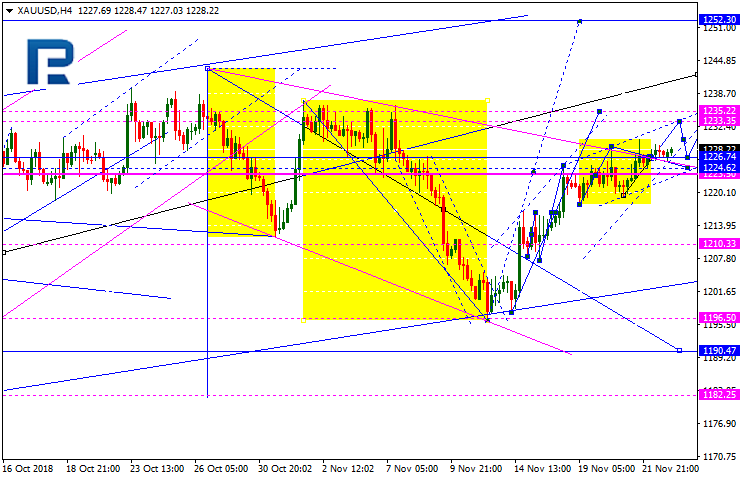 Possibly, the price may choose an alternative scenario to reach 1233.35. After that, the instrument may fall towards 1226.74 and then start another growth to reach 1235.25. In fact, the pair may form the fifth ascending wave with the target at 1252.30. Considering that the correction was a three-wave structure, the price may start plummeting towards 1190.00 at any moment and then start forming the fifth wave described above. Later, the market may resume falling to reach 1110.00. Brent is trading downwards. Today, the price may reach 61.40 and then resume growing towards 62.57. 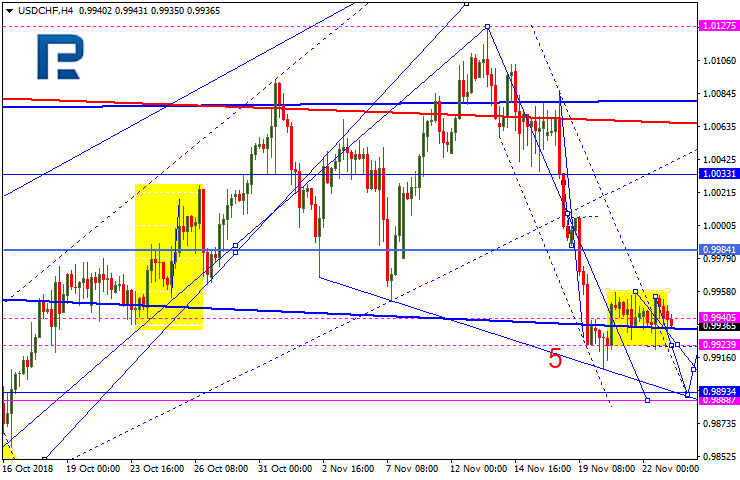 Later, the market may start a new decline with the target at 60.60. 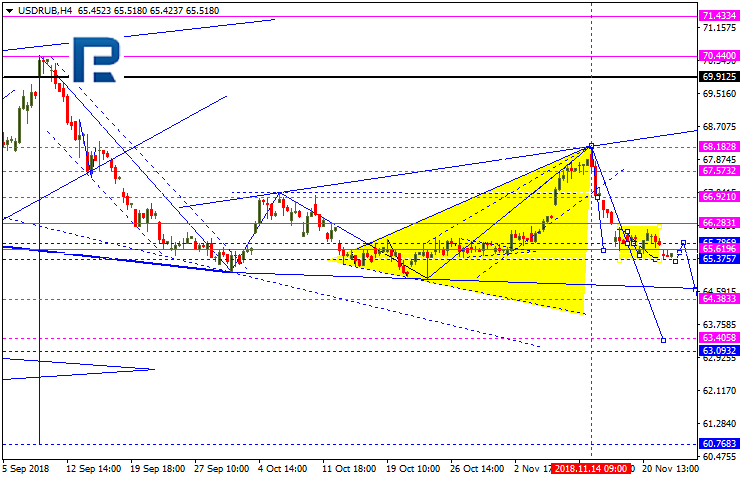 After that, the instrument may form a reversal pattern for a new ascending wave with the first target at 68.88.